Amish Flat Top Computer Desk with Raised Panel Back 48"
Beautiful solid hard wood is used on this distinctly striking office Computer Executive Desk. This Amish made solid wood desk is built using Old World techniques. You don’t find desks these well built these days! The desk includes file drawer and raised panel back. The desk pedestal can be reversed upon request. Desk compartments in some drawers help keep your items organized. Call to order your Amish made desk today! 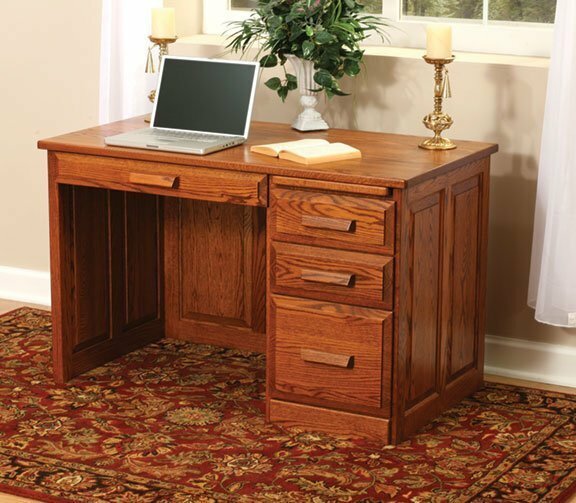 (Item 8489) Amish Flat Top Computer Desk with Raised Panel Back 48"